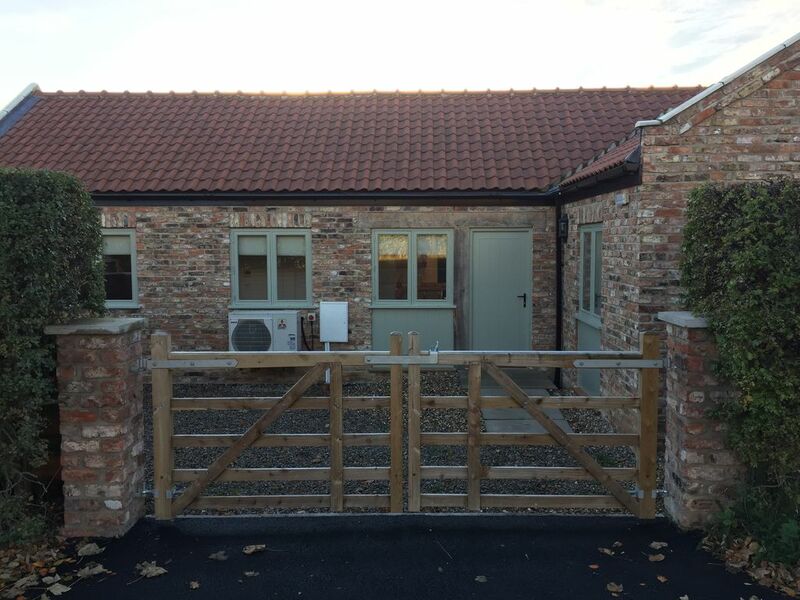 Glebe Farm Cottage is a new build in a quiet village location approx. 5 miles from York city centre and convenient for Sandburn Hall Golf Club. The cottage contains an open plan kitchen, dining, living area. With a double bedroom with on suite shower room with WC and sink and a twin bedroom and a house bathroom with a shower WC and sink. Amenities: Electric oven and hob, microwave, fridge freezer, washing machine, ironing board and iron, hairdryer, TV with Freeview, DVD, WiFi, selection of books and DVDs. Bed linen and towels inc. in rent. Travel cot and highchair. Off road parking for 2 cars. Small rear patio area with furniture. Really good communication with owner, very helpful. Property is spacious, clean, well decorated and comfortable. Everything we required was there. Jayne had even left us a pack of groceries in case we had not had time to stock up. Bread, orange drink, milk, cereals and jams, butter, biscuits and 2 packs of bacon. She recommended some pubs for our evening meal which were less than 10 minutes away. Parking for 2 cars. Perfect for 2 couples. We were at a wedding at Sandburn Hall about a mile away. The property is just off the A64 so gives easy access to York if you use the Park and Ride down the road. Loads of other places nearby. Superb cottage with such a warm lovely owner. On arrival there was a welcome pack including bacon, bread, milk etc. Nothing was a problem & we loved every moment there. Only 5 minutes from York centre was another bonus. We cant wait to stay there again. Had 2 nights stay in this lovely cottage. The property is lovely and very convenient for York and surroundings. Welcome pack with cakes, milk, bread, butter, orange juice, cereal and jam. Tea, coffee and sugar too. 2 issues though the heating didn't come on and the last night was a bit cold (need a secondary heat source if the underfloor heating isn't reliable) and need a shelf or similar in the showers. We stayed for 4 nights and found everything just perfect, the welcome pack was great and very much appreciated, it was spotlessly clean,very roomy and comfortable, it would make an ideal place for a short break or for a week or more, Jayne the owner is the perfect host and met us on arrival and explained everything and was on hand if required. We arrived late in the dark, to be welcomed by a lovely, clean and very well appointed accommodation. Nice touch of grocery pack and home made cupcakes. Would highly recommend this place to anyone, if we are back in the area would not think twice in re booking.